As an aside, here's a link to what is probably my all time EVER favourite Christmas tree card. I love the funky, non traditional colours and the Seussian shape of the trees. It's by Happy Dancin' Bev and it's the card that 'introduced' us. She is a true delight - and a very talented cardmaker. Now we're friends with plans to actually meet up this fall - I'm so looking forward to it! You have until Wednesday to link up your "tree" cards - hope to see you there! You are SO clever!! I LOVED the diversity this week, and your card is just so COOL. 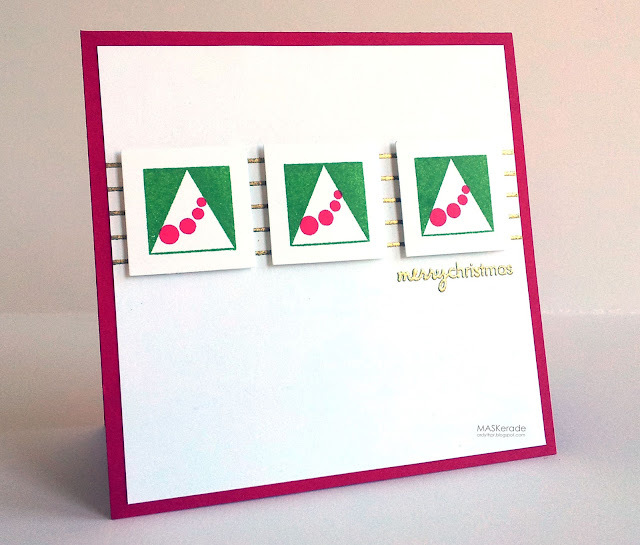 I just love how you put these stamps together to make the perfect tree card!!! SUPER CAS!! Love this so much. Bright, vibrant, graphic and FUN, FUN, FUN!! First, your card is brilliant. I have both of those PTI sets, and never thought to use them like this. I can see I'll have to CASE your card! It's gorgeous. Hot pink, kelly green, and gold on white. Perfectly brilliant. Love this! Only YOU are creative enough to take a square and a grunge element and make a tree!! Fabulous! I just came from Lynn's blog with her beautiful Christmas tree... the 2 of you inspire me! Ardy, this is so you, so modern, so graphic, so innovative ... WOWZA. Your little square "trees" are inspired and I love the golden lines behind them! Loving that gold embossing! Great card!!! I thought this card was so amazing, I tucked it away in my mind to "CASE" at a later time - tho I was ever so inspired and I have done it tonight! Here is my link, and I credited back to you! (so it is all your fault haha LOL).. Thanks for reminding me to link today's card up at Festive Friday, Ardyth! Your little trees are so cute and so very precise! This is just too darn cute! I love your trio of trees and the shiny gold, so festive!